Another winter is nearing a close on Loch Lomond. This is the third that I have documented – or partly so. The first, 2010/11, was the coldest in decades with Arctic conditions for many weeks. Scroll down for photos taken then. 2011/12 was mostly wet, but we did get the odd snowfall. A pictorial look at that winter also follows. This year, 2012/13, while very snowy at times in the South of the U.K., saw not a lot of the white stuff here. For a few days at the end of November and beginning December, several inches fell on the lowlands with a goodly amount on higher elevations. A nasty dose of flu kept this photographer from capturing images of that. I have added the few images and videos I did get later in the season to those already posted. 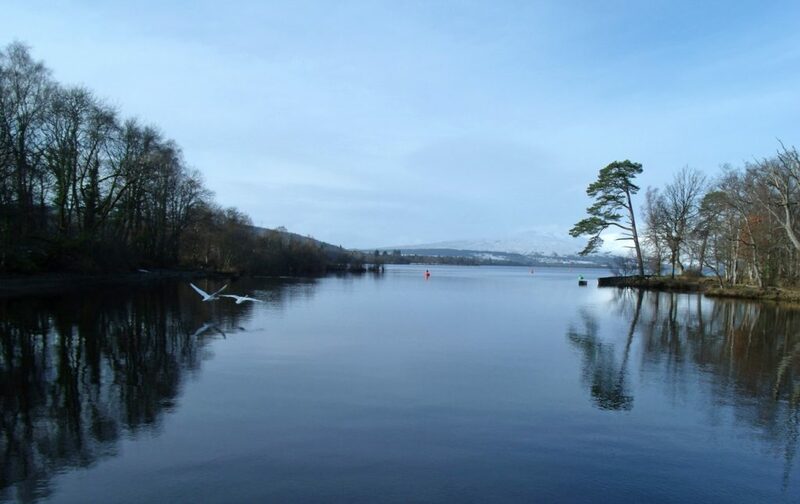 From Balloch, one can take an hour long cruise on the South end of the loch all winter long, weather permitting. On a rare sunny day recently, I boarded Sweenie’s cruise boat, The Silver Marlin, and caught a half hour of blue skies and azure water before the clouds rolled in once more and painted the landscape grey. 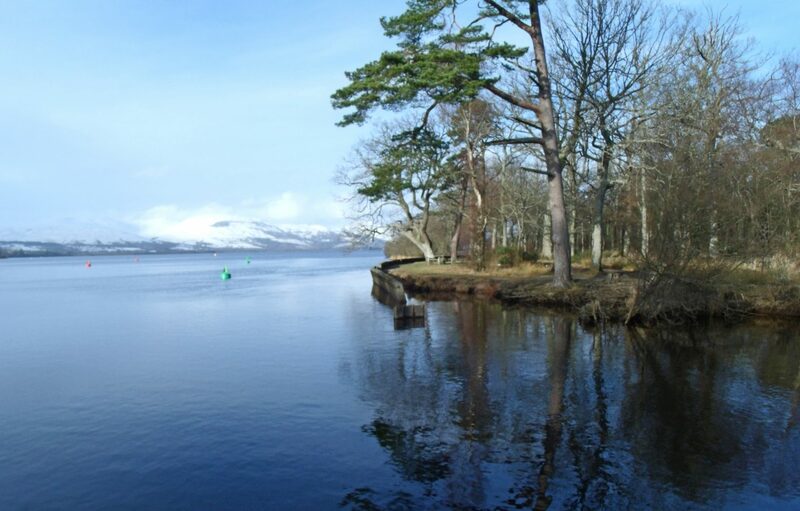 The boats leaves from a landing situated where Loch Lomond ends and the River Leven begins. Balloch Park and the town center make a picturesque setting for the start of the cruise. 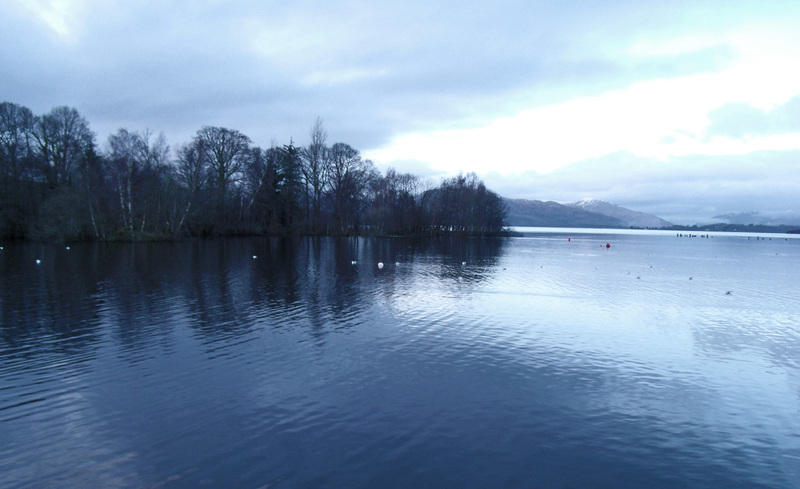 The first photos and videos I posted in ‘Loch Lomond, Limericks And Life’ were taken in November and December of 2010. This posting sees the start of another winter; a very different winter. While last year was arctic cold for months with much snow in early November, it is now late December, 2011, and we have just had our first snowfall. 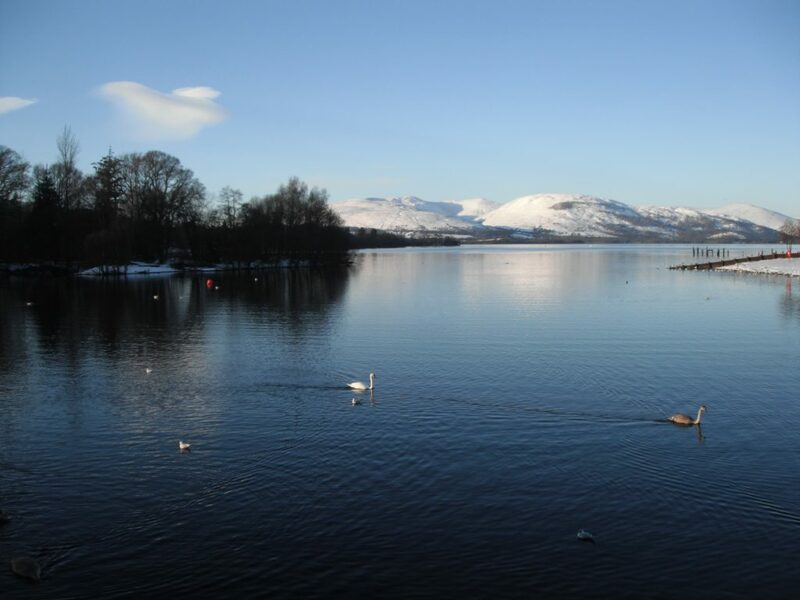 At twenty-six miles long, or thereabouts, Loch Lomond is the largest loch in Scotland. In the weeks and months ahead I will share more photos and videos of the Scottish landscape in the area in which I live. 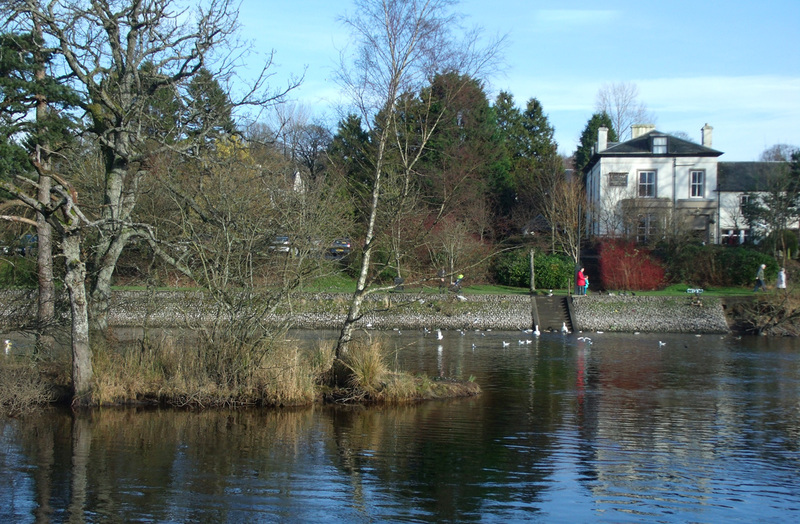 Balloch is situated at the south end of the loch where it narrows and becomes the River Leven. I will bring you pictures and videos of its journey through Alexandria and Renton to Dumbarton. 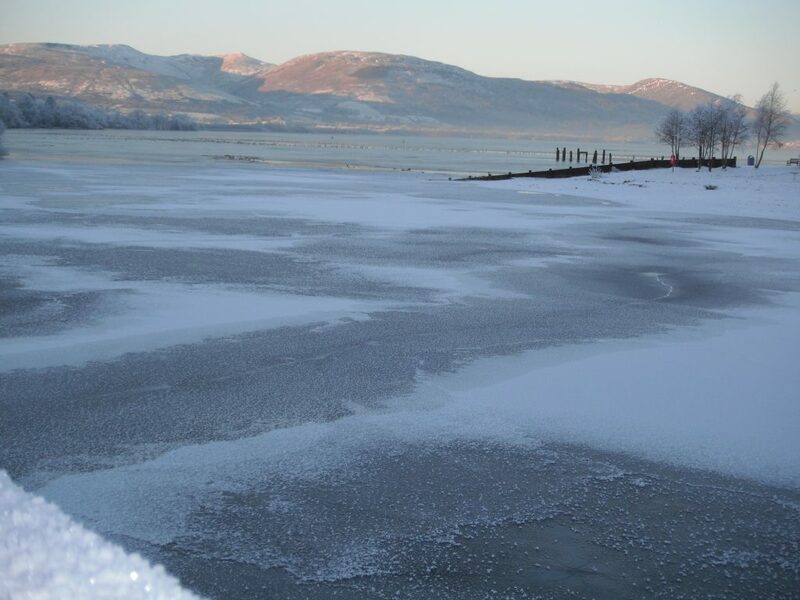 Ice covered Loch Lomond Only the shallowest water froze. This body of water has an average depth of 37 metres (121 ft) and, at it deepest, is 190 meters (620 ft). It has the largest surface area of any loch/lake in the United Kingdom – 27 square miles. Loch Ness boasts the highest volume of water putting Loch Lomond in second place. The sunlit mountain in the background of the above video is Ben Lomond. Below are photos and videos I took in November and December. 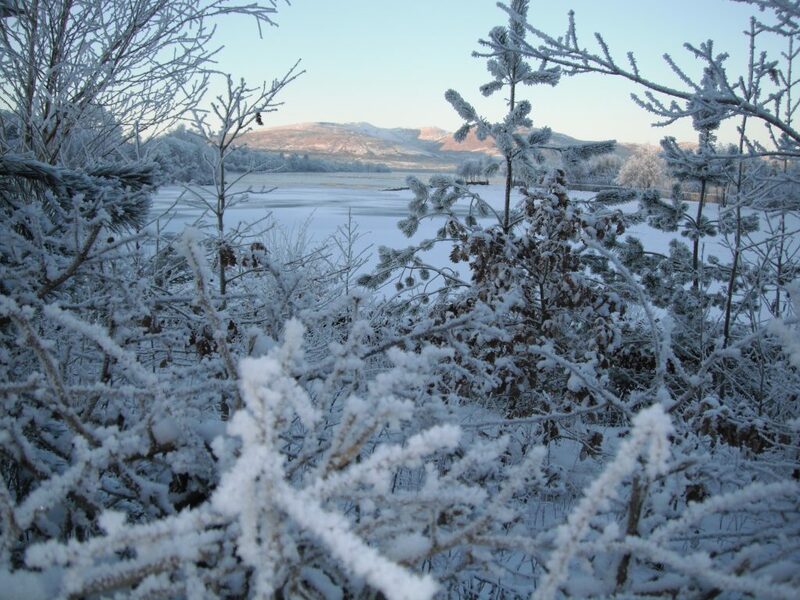 We had weeks of arctic weather when parts of the loch were frozen, as in this scene. Loch Lomond has many moods with faces to match. Trees in Christie Park, Alexandria. This is another of the pictures I took in December. Alexandria is about a mile from Loch Lomond and Balloch. It was minus ten degrees centigrade at the time. It strikes me as I post these recent photos that they are already history. What, a short while ago was SO in the moment, the arctic weather, the new camera, Christmas approaching, is all past, a memory. Since photos capture a moment, they’re history a minute later, just some more ancient than others. Of such stuff are stories born. January and February were foggy and wet, so I did not get any worthwhile pictures. 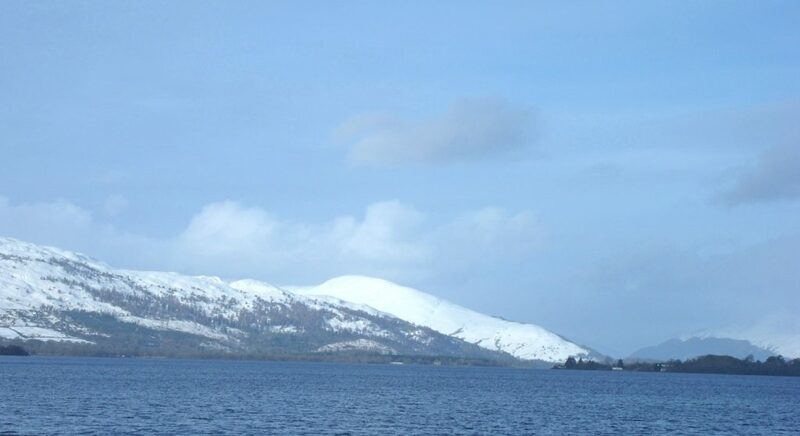 For many more photos, videos and historical information of the Loch Lomond area, the Highlands and islands of Scotland plus stories, limericks etc., click on the menu icon (3 horizontal lines beside lochsplus) at top of page. i have fond memories of balloch and alexandria, my great aunt lived in alexadria , and our summer hols . were always with her . i visited her house in alexandria street , few yrs ago , and its still there !nostalga wasnt the word for it!lol it took me right back to the great times we had as kids me and my sister .we went to christie park often with our parents and spent most of the day there . they used to play the pop music of the time , which wouldve been the sixties , and we would swing away to our hearts content lol,onthe swings that is lol, i look forward to seeing more of your pics . thank you, they are really good . Thanks for the comments, Elizabeth. I was delighted to hear from you. So glad you enjoyed the postings. I’ll certainly keep the photos and videos coming. Hi Christine, I’ve had a look at your gorgeous videos and had no problem viewing them. They are so stunning! It’s so great to have all that on our doorstep. I take our little boy and our big dog walks in Balloch park regularly but never get over how beautiful it is. 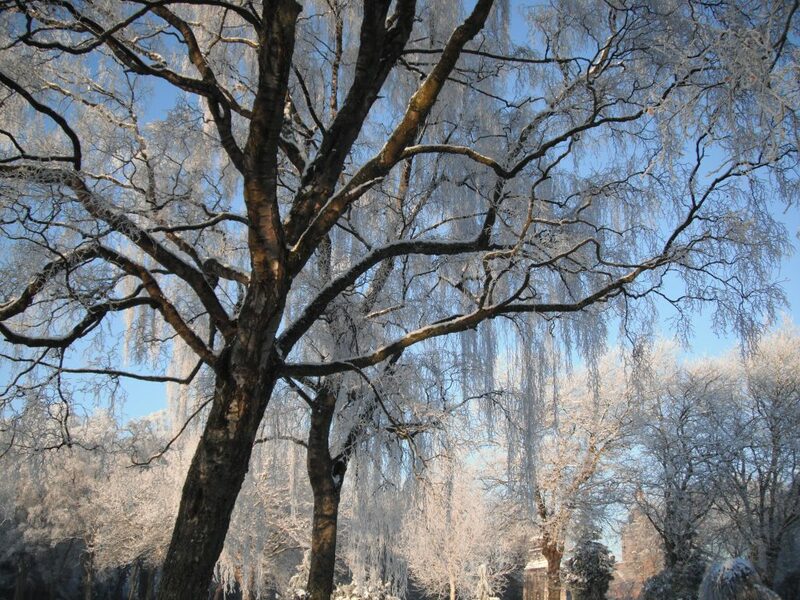 I must say your photos of Ice covered Loch Lomond and of The trees in Christie park are just inspiring!!! I’ve not done much photography since having our little boy, he turned 3 on Tuesday there so its been a while. Just haven’t had the time as i work full time too. But you have certainly inspired me to brush the dust off my camera. Jacqui! Thanks for taking the time to check out the videos and report back to me. Photography is so very therapeutic, even at my amateur stage. I know it’s difficult with full time work both in and outside the home, but a little time doing your own thing will be so good for you all. Go for it! The videos are very rarely played be viewers though so I’ll re-upload them with Flash uploader and see if that makes a difference. Thanks for the encouragement.